The story is set in Nuremberg in the mid-16th century. At the time, Nuremberg was a free imperial city and one of the centers of the Renaissance in Northern Europe. The story revolves around the city's guild of Meistersinger (Master Singers), an association of amateur poets and musicians who were primarily master craftsmen of various trades. The master singers had developed a craftsmanlike approach to music-making, with an intricate system of rules for composing and performing songs. The work draws much of its atmosphere from its depiction of the Nuremberg of the era and the traditions of the master-singer guild. One of the main characters, the cobbler-poet Hans Sachs, is based on a historical figure, Hans Sachs (1494–1576), the most famous of the master singers. Die Meistersinger von Nürnberg occupies a unique place in Wagner's oeuvre. It is the only comedy among his mature operas (he had come to reject his early Das Liebesverbot), and is also unusual amongst his works in being set in a historically well-defined time and place rather than in a mythical or legendary setting. It is the only mature Wagner opera based on an entirely original story, devised by Wagner himself, and in which no supernatural or magical powers or events are in evidence. It incorporates many of the operatic conventions that Wagner had railed against in his essays on the theory of opera: rhymed verse, arias, choruses, a quintet, and even a ballet. This first draft of the story was dated "Marienbad 16 July 1845". Wagner later said, in Eine Mitteilung an meine Freunde (1851) (A Communication to my Friends)  that Meistersinger was to be a comic opera to follow a tragic opera, i.e. Tannhäuser. Just as the Athenians had followed a tragedy with a comic satyr play, so Wagner would follow Tannhäuser with Meistersinger: the link being that both operas included song-contests. wenn er sich wühlt ins eig'ne Fleisch, wähnt Lust sich zu erzeigen! when he tears into his own flesh, he imagines he is giving himself pleasure! Having completed the scenario, Wagner began writing the libretto in 1862, and followed this by composing the overture. The overture was publicly performed in Leipzig on 2 November 1862, conducted by the composer. Composition of act 1 was begun in spring of 1863 in the Viennese suburb of Penzing, but the opera in its entirety was not finished until October 1867, when Wagner was living at Tribschen near Lucerne. 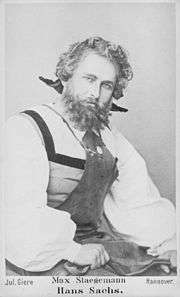 These years were some of Wagner's most difficult: the 1861 Paris production of Tannhäuser was a fiasco, Wagner gave up hope of completing Der Ring des Nibelungen, the 1864 Vienna production of Tristan und Isolde was abandoned after 77 rehearsals, and finally in 1866 Wagner's first wife, Minna died. Cosima Wagner was later to write: "When future generations seek refreshment in this unique work, may they spare a thought for the tears from which the smiles arose." The premiere was given at the Königliches Hof- und National-Theater, Munich, on June 21, 1868. The production was sponsored by Ludwig II of Bavaria and the conductor was Hans von Bülow. Franz Strauss, the father of the composer Richard Strauss played the French horn at the premiere, despite his often-expressed dislike of Wagner, who was present at many of the rehearsals. Wagner's frequent interruptions and digressions made rehearsals a very long-winded affair. After one 5 hour rehearsal, Franz Strauss led a strike by the orchestra, saying that he could not play any more. Despite these problems, the premiere was a triumph, and the opera was hailed as one of Wagner's most successful works. At the end of the first performance, the audience called for Wagner, who appeared at the front of the Royal box, which he had been sharing with King Ludwig. Wagner bowed to the crowd, breaking court protocol, which dictated that only the monarch could address an audience from the box. The first mastersingers file into the church, including Eva's wealthy father Veit Pogner and the town clerk Beckmesser. Beckmesser, a clever technical singer who was expecting to win the contest without opposition, is distressed to see that Walther is Pogner's guest and intends to enter the contest. Meanwhile, Pogner introduces Walther to the other mastersingers as they arrive. Fritz Kothner the baker, serving as chairman of this meeting, calls the roll. Pogner, addressing the assembly, announces his offer of his daughter's hand for the winner of the song contest. When Hans Sachs argues that Eva ought to have a say in the matter, Pogner agrees that Eva may refuse the winner of the contest, but she must still marry a mastersinger. Another suggestion by Sachs, that the townspeople, rather than the masters, should be called upon to judge the winner of the contest, is squelched by the other masters. Pogner formally introduces Walther as a candidate for admission into the masterguild. Questioned by Kothner about his background, Walther states that his teacher in poetry was Walther von der Vogelweide whose works he studied in his own private library in Franconia, and his teachers in music were the birds and nature itself. Reluctantly the masters agree to admit him, provided he can perform a master-song of his own composition. Walther chooses love as the topic for his song and therefore is to be judged by Beckmesser alone, the "Marker" of the guild for worldly matters. At the signal to begin, Walther launches into a novel free-form tune, breaking all the mastersingers' rules, and his song is constantly interrupted by the scratch of Beckmesser's chalk on his chalkboard, maliciously noting one violation after another. When Beckmesser has completely covered the slate with symbols of Walther's errors, he interrupts the song and argues that there is no point in finishing it. Sachs tries to convince the masters to let Walther continue, but Beckmesser sarcastically tells Sachs to stop trying to set policy and instead, to finish making his (Beckmesser's) new shoes, which are overdue. Raising his voice over the masters' argument, Walther finishes his song, but the masters reject him and he rushes out of the church. As twilight falls, Hans Sachs takes a seat in front of his house to work on a new pair of shoes for Beckmesser. He muses on Walther's song, which has made a deep impression on him. A meditative prelude introduces music from two key episodes to be heard in Act 3: Sachs's Scene 1 monologue "Wahn! Wahn!" and the "Wittenburg Nightingale" quasi-chorale sung by the townspeople to greet Sachs in Scene 5. Beckmesser, still sore from his drubbing the night before, enters the workshop. He spots the verses of the Prize Song, written in Sachs's handwriting, and infers that Sachs is secretly planning to enter the contest for Eva's hand. The cobbler re-enters the room and Beckmesser confronts him with the verses and asks if he wrote them. Sachs confirms that the handwriting is his, but does not clarify that he was not the author but merely served as scribe. However, he goes on to say that he has no intention of wooing Eva or entering the contest, and he gives the manuscript to Beckmesser as a gift. He promises never to claim the song for his own, and warns Beckmesser that it is a very difficult song to interpret and sing. Beckmesser, his confidence restored by the prospect of using verses written by the famous Hans Sachs, ignores the warning and rushes off to prepare for the song contest. Sachs smiles at Beckmesser's foolishness but expresses hope that Beckmesser will learn to be better in the future. Eva arrives at the workshop. She is looking for Walther, but pretends to have complaints about a shoe that Sachs made for her. Sachs realizes that the shoe is a perfect fit, but pretends to set about altering the stitching. As he works, he tells Eva that he has just heard a beautiful song, lacking only an ending. Eva cries out as Walther enters the room, splendidly attired for the festival, and sings the third and final section of the Prize Song. The couple are overwhelmed with gratitude for Sachs, and Eva asks Sachs to forgive her for having manipulated his feelings. The cobbler brushes them off with bantering complaints about his lot as a shoemaker, poet, and widower. At last, however, he admits to Eva that, despite his feelings for her, he is resolved to avoid the fate of King Marke (a reference to the subject of another Wagner opera, Tristan und Isolde, in which an old man tries to marry a much-younger woman), thus conferring his blessing upon the lovers. David and Magdalena appear. Sachs announces to the group that a new master-song has been born, which, following the rules of the mastersingers, is to be baptized. As an apprentice cannot serve as a witness for the baptism, he promotes David to the rank of journeyman with the traditional cuff on the ear (and by this also "promoting" him as a groom and Magdalena as a bride). He then christens the Prize Song the Morning Dream Song (Selige Morgentraumdeut-Weise). After celebrating their good fortune with an extended quintet, the group departs for the festival. The Feast of St. John is taking place. The various guilds hold their processions boasting on how each has made Nürnberg a great city, culminating in the arrival of the mastersingers. The crowd sings the praises of Hans Sachs, the most beloved and famous of the mastersingers. The prize contest begins. Beckmesser attempts to sing the verses that he had obtained from Sachs. However, he garbles the words and fails to fit them to an appropriate melody, and ends up singing so clumsily that the crowd laughs him off. Before storming off in anger, he yells that the song was not even his; Hans Sachs tricked him into singing it. The crowd is confused—how could the great Hans Sachs have written such a bad song? Sachs tells them that the song is not his own, and also that it is in fact a beautiful song which the masters will love, when they hear it sung correctly. To prove this, he calls a witness: Walther. The people are so curious about the song that they allow Walther to sing it, and everyone is won over in spite of the song's novelty. They declare Walther the winner, and the mastersingers want to make him a member of their guild on the spot. At first Walther is tempted to reject their offer, but Sachs intervenes once more, and explains that art, even ground-breaking, contrary art like Walther's, can only exist within a cultural tradition, which tradition the art sustains and improves. Walther is convinced; he agrees to join. Pogner places the symbolic Master-hood Medal around his neck, Eva takes his hand, and the people sing once more the praises of Hans Sachs, the beloved mastersinger of Nuremberg. ↑ Warrack, John (ed.) (1994). Die Meistersinger Von Nurnberg (Cambridge Opera Handbooks). Cambridge University Press. ISBN 0-521-44895-6. ↑ "A Communication to my Friends"
↑ Millington, Barry (Ed.) (1992). The Wagner Compendium: A Guide to Wagner's Life and Music. Thames and Hudson Ltd., London. ISBN 0-02-871359-1 p. 304. ↑ Millington, Barry. "Wagner Washed Whiter." The Musical Times, Vol. 137, No. 1846 (December 1996), pp. 5–8. ↑ Vaget, Hans Rudolf. "Wagner, Anti-Semitism, and Mr. Rose: Merkwürd'ger Fall! ", The German Quarterly, Vol. 66, No. 2 (Spring 1993). pp. 222–236. ↑ Rose, Paul Lawrence. "The Wagner Problem in the History of German antisemitism." The German Quarterly. Vol 68. No. 3 (Summer 1995). pp. 304–305. ↑ Zaenker, Karl A. "The Bedeviled Beckmesser: Another Look at Anti-Semitic Stereotypes in Die Meistersinger von Nürnberg". German Studies Review. Vol 22. No. 1 (February 1999). pp. 1–20. ↑ Tenenbom, Tuvia. "Hallo, Herr Hitler! ", Die Zeit, August 13, 2009. ↑ Bermbach, Udo (et al.) (2007). Wagnerspectrum: Schwerpunkt Wagner und das Komische (in German). Königshausen & Neumann. ISBN 978-3-8260-3714-6. ↑ Australian Opera, 1990, conducted by Sir Charles Mackerras, manufactured by Public Media Homevision. Also in John Dew's production at Darmstadt (2008) and Gothenburg (2010). ↑ Carnegy (1994) pp. 137–138. ↑ Carnegy (1994) p. 140. ↑ Carnegy (1994) p. 141.